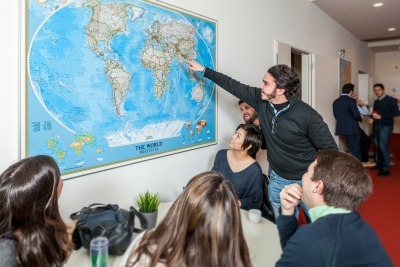 Although Technische Universität Berlin does not itself provide student accommodation, the "Studentenwerk Berlin" (a local non-profit agency for student affairs) offers several accommodation options for students enrolled at educational institutions in Berlin. Results of the Graduate Management Admission Test (GMAT), Graduate Record Examination (GRE) OR similar qualification. You can find more information about the application procedure online at our website: www.master-in-energy.com. Most of all, this implies re-directing from a mainly fossil-fueled energy supply towards renewable energies and a much more energy-efficient use of energy in buildings and urban areas. This is one of the largest and most urgent challenges of current urban development and other social disciplines. Finding solutions to such a complex challenge means that a multitude of actors from business, society, and public administration take part in the process and influence it with their differing and often conflicting interests. Resulting from this is the need for skilled workers who both understand all stakeholders and can work with them. Strategic concepts for communication and cooperation in large-scale projects are crucial for their success. Whereas, “simply” building a house has become a manageable task, things become much more complicated when considering the urban environment and wider interests such as energy efficiency. The Master program, Building Sustainability, focuses therefore, not only on technical and economic perspectives, but also aims at imparting relevant knowledge from other disciplines. This means that the scope of the program is both broad and specific at the same time. The combination of technology, management and sustainability-related topics is therefore a unique opportunity for young professionals to extend their skills. The MBA program Building Sustainability – Management Methods for Energy Efficiency will teach students skills, methods, and concepts to consider different approaches, to understand them and to align them for reaching sustainable solutions. Such competences are not only important in the context of the Energiewende but they are indispensable in every building, construction and real estate project that takes energy efficiency and other sustainability criteria into account. The idea is that sustainable project results that consider economic, ecological, and social aspects can only be achieved in extensive cooperation of all stakeholders. Managing and moderating such a cooperation is one of the major challenges of implementing sustainability in building projects of all scales. The program aims therefore on enabling students to understand the complexity of planning and management processes and to develop according solutions. This will happen in modules with different approaches: some will teach facts and numbers, others will facilitate connections between different fields and the softer skills of mediating between them and some are designed to apply these competences to practical projects. The TU-Campus EUREF is located on the EUREF (European Energy Forum) campus in Berlin-Schöneberg. This former industrial area has been developed into a research hub for energy efficiency, renewable energies, and smart grids. Students will gain insight into the numerous real-life examples of building sustainability without having to leave the campus. The program addresses a broad group of professionals with varying academic backgrounds, mostly in engineering and technology, management, economics, architecture and urban or environmental planning. However, applicants with other academic backgrounds coupled with working experience in a related field are also encouraged to apply, personal motivation plays an important role in the selection process. Class diversity is one of its greatest assets, as students will not only learn from lecturers with science and business backgrounds, but also from each other. Graduates will be able to moderate and manage complex projects in the construction, real estate, and planning sector. They will be able to assess the project from technical, ecological, and economic perspectives and find solutions which take all stakeholders into account. Management decisions in the sustainable building sector require a profound understanding of the sector’s technical, economic, legal, and entrepreneurial peculiarities. Climate and economic changes, controversial opinions, technological progress as well as regulation shape and limit the entrepreneurial room, but also offer chances and opportunities. The industry, therefore, requires broadly skilled individuals who are experts in the field. The master program is taught over a period of three semesters. The first semester covers the technical, economic, entrepreneurial and legal foundations for management decisions in the sustainable building sector; the second semester deepens this view and looks at business practices, offers a review of current challenges with a lecture series and an provides application of the skills acquired in an interdisciplinary project; the third semester broadens the view while simultaneously focusing on practice according to student’s individual interests. All semesters include lectures, tutorials, seminars as well as excursions, online materials related to practice and extracurricular activities. The Master Thesis is written at the end of the third semester and concludes the program. Project designed to apply all the knowledge learned in the previous modules. The internationally renowned Technische Universität Berlin (TUB) is located in Germany's capital city at the heart of Europe. The academic activities are focused on achieving sharply-defined goals: building a distinctive profile for our university, ensuring exceptional performance in research and teaching, providing our graduates with excellent qualifications and a modern approach to university administration. The TU Berlin strives to promote the dissemination of knowledge and to facilitate technological progress through adherence to the core principles of excellence and quality. Strong regional, national, and international networking with partners in science and industry are an important aspect in these endeavors. TU Berlin is an internationally renowned research-intensive university dedicated to promoting science and technology for the benefit of broader society and committed to the principle of sustainability. The challenges and problems facing modern societies cannot be met on the basis of findings from individual disciplines. TU Berlin is addressing these challenges with the aid of transdisciplinary collaborative projects. The establishment of important research partnerships in the context of the Excellence Initiative, the German Research Foundation (DFG) and European Institute for Innovation and Technology, in addition to constantly increasing third-party funding for the research projects, demonstrate the dynamic developments in this area. Prestigious science prizes and awards make these successes even more obvious; these include Alexander von Humboldt Chairs, Einstein Chairs, Gottfried Wilhelm Leibniz Prizes, and numerous grants from the European Research Council. Research for Innovation - a credo that TU Berlin impressively implements. Its extraordinary profile as a technical university in association with its humanities, social, planning, and economic sciences programs is indeed an excellent breeding ground for strong interdisciplinary work. By combining basic and applied research endeavors, and with close links to partners in science and industry, university researchers tackle societal issues and develop forward-looking solutions. The study location is on the site of the European Energy Forum (EUREF) around the historical Gasometer in Berlin-Schöneberg. The Campus is the setting of an innovative community including applied research, economic and policy consultancies mainly based on the philosophy of sustainability. Students, who will be the future's energy experts, learn in close cooperation with leading enterprises and institutions located on the EUREF-Campus to become acquainted with practical projects in the field of energy.